Photos by Brian Starzomski (left) and Georgia Brander. Oval-leaved blueberry is a perennial deciduous spreading shrub growing to 2 m tall, with strongly angled and grooved brown, yellow or reddish twigs. The blunt-tipped oval leaves are 2-4 cm long and usually have smooth edges, though there may occasionally be a few very fine teeth. Flowers are creamy to yellow pink, 5-6 mm long, oval/bell shaped and growing individually in leaf axils. These flowers appear either before or at the same time as the leaves. The edible berries, measuring 6-8 mm in diameter, are purple to reddish black when they ripen in summer. Oval-leaved blueberry is found in dry to moist coniferous forests at mid to alpine elevations. It can be found from Alaska down the Pacific Coast to Oregon, and east through Alberta and the Northwest Territories as well as in Newfoundland, Labrador, Quebec, and the Maritimes. 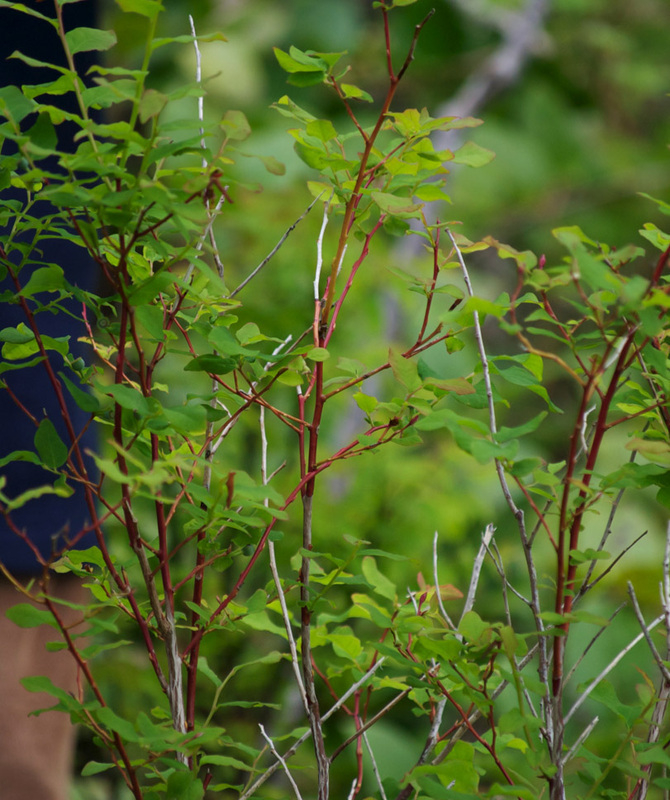 Oval-leaved blueberry is often found with Alaskan blueberry (Vaccinium alaskaense) forming dense thickets. While they are very similar, the oval-leaved blueberry is distinguished by its finer and more highly-branched reddish twigs. Other similar species from the Vaccinium genus include the black huckleberry (Vaccinium membranaceum), red huckleberry (Vaccinium parvifolium), dwarf blueberry/bilberry (Vaccinium caespitosum), and the bog blueberry (Vaccinium uliginosum). Pojar, J. and MacKinnon, A. (1994). 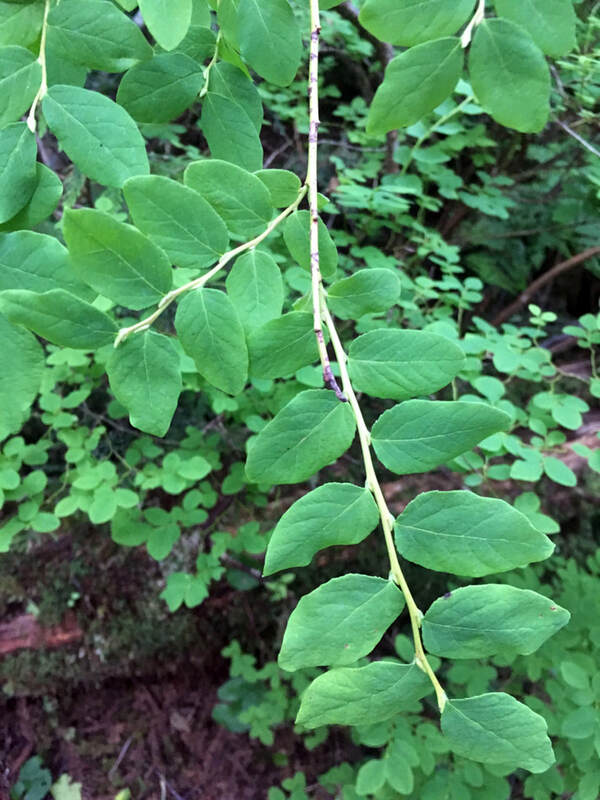 Plants of Coastal British Columbia, including Washington, Oregon, and Alaska. Vancouver, BC: Lone Pine Publishing. P 182. Vaccinium ovalifolium sm. oval-leaf blueberry. United Stated Department of Agriculture Natural Resources Conservation Service. Accessed on 20/11/14. Vaccinium ovalifolium Sm.oval-leaved blueberry. In Klinkenberg, Brian. (Ed.). E-Flora BC: Electronic Atlas of the Plants of British Columbia. Lab for Advanced Spatial Analysis, Department of Geography, University of British Columbia, Vancouver. Accessed 21/11/2014. Paige Whitehead and Brian Starzomski (2014).